TeachersFirst - Classroom Resource Resources with the subject "history-culture-ancient"
Learn something new each day with Highbrow's unique course delivery system. Sign up for a course, then receive an email each day with a five to ten-minute lesson. Each course is completed in ten days making learning quick and easy! Choose from many different course options in subjects such as art, literature, and history. Highbrow only allows one course per user at a time to encourage complete focus on each topic. If you don't see what you like, choose the Create Course option and create your own learning experience using your expertise! Highbrow is perfect for differentiated learning. Allow students to choose their own topic and sign up for a course. When complete, choose another topic and start a new course. Have students create commercials for finished courses using Powtoon, reviewed here, and share them using a tool such as TeacherTube, reviewed here. Challenge students to create a course after a unit of study as a final assessment. Be sure to include this site on your class webpage for students to access both in and outside of class for personal use. Mr. Moore's Classroom shares resources used in his social studies courses which include AP US History, Debate, and World History. Each content area includes a course syllabus, learning calendars, and information by unit. Some sections include more information and activities than others. Choose the Presentations link to find links to videos, Prezi presentations, and interactive games and simulations. If your district blocks YouTube, then the videos may not be viewable. You could always view them at home and bring them to class "on a stick" to share. Use a tool such as Online-Convert, reviewed here, to download the videos from YouTube. Bookmark and save Mr. Moore's Classroom as a supplement to your current social studies teaching materials. Find new ideas for Debate Team. Take advantage of the free materials and planning information offered on this site. Share this site with colleagues. The Walters Art Museum opened in 1934 in Maryland. This site has information about the museum, its founders, the long history, and more. Take a deeper dive by looking at exhibits and the pieces of art found there. Use the search bar to find lesson plans and resources, or take advantage of the potential for video conferencing with museum educators. Utilize the section for Integrating the Arts to teach cross-curricular lessons in any of the core subject areas. Find the integration lessons categorized by ancient civilizations such as China or Islam. Also check out the Teacher Resources area for quite a few lesson plans that include different topics such as Ancient Storytelling, Egyptian Symbols, Coat of Arms, Warhol Stained Glass, The Nutcracker, Mapping the Past - Mapping the Present, and many more. Use the Integrating the Arts sections to find printable lesson plans to create cross-curricular lessons. The lesson plans include objectives, multiple activities, examples, and a wrap-up. Students can then use the site to find other pieces of art that demonstrate or support the same concept. Connect middle and high school students to the museum through one of the prescheduled video conference calls to learn about specific topics. Be sure to prepare students for the conference call, and encourage students to participate with comments and questions to enhance the learning experience. After the conference, have students navigate through the pieces of art on the site that relate to the topic from the video conference. Histography is an interactive timeline spanning history from the beginning through 2015 (as of this review), pulling historical events from Wikipedia. Drag the bar across the timeline to any point in history to view stacks of dots representing events. Click any dot to view the event and then go to the link on Wikipedia, if desired. Use the left sidebar to view specific topics such as music or politics throughout history. Be sure to take some time to explore this site by clicking around to find other options such as "Feeling Lucky" or to expand your view using slider bars at the bottom of the graph. Explore different time periods together on an interactive whiteboard or projector. Discover different events included on similar dates to help students understand an overall view of events during any period. Share with students as a resource for finding information and events to include with multimedia projects for any event such as the American Revolution, the Iron Age, or events leading up to World Wars. Over the years Tom Richey has taught several different history courses. His site shares many of his teaching materials. Choose the Courses drop-down box to go directly to different courses including AP History, AP European History, Modern World History, and more. Each course includes assignment information, primary sources, videos, and all information needed to set up a curriculum. Click on the PowerPoint selection to find a large variety of PowerPoint presentations for free download. Other links lead to review guides, video lectures, and flashcards. Be sure to check out this site when you have lots of time to explore the many resources included! If your district blocks YouTube, the videos may not be viewable. You could always view them at home and bring them to class "on a stick" to share. Use a tool such asOnline-Convert, reviewed here, to download the videos from YouTube. Tom Richey has put together an excellent resource for any secondary level history teacher. Take advantage of the many free materials to supplement your current curriculum. Share a link to videos and review information on your class web page for student use at home or view together on your interactive whiteboard or projector. Be sure to share with students as they prepare for AP exams. The Los Angeles Unified School District offers a large selection of resources for teaching history and social sciences aligned to Common Core Standards. Choose from elementary, middle, or high school to find curriculum maps and lessons. One very useful portion of the site includes lessons created in partnership with Reading Like a Historian, reviewed here, that engage students in the creation of historical knowledge. Both sites are a must-visit for anyone teaching Social Studies! Bookmark and save this site for use throughout the school year. Be sure to take advantage of the lesson plans and curriculum guides. Share with other teachers as you collaborate and plan together. This engaging YouTube channel offers an excellent variety of videos for AP U.S. and European History and AP Government. Additional offerings include review sessions about South Carolina history. Each video explains different topics in history through lecture. Videos range in length from one minute to over an hour. If your district blocks YouTube, the videos may not be viewable. You could always view them at home and bring them to class "on a stick" to share. Use a tool such as Online-Convert, reviewed here, to download the videos from YouTube. Mark this one in your teacher favorites to find videos to use in AP History and Government classes. Be sure to share videos with students and parents, especially videos with study plans for AP tests. Create a link to this YouTube channel on your class website or blog for students to access at home. Can't take a field trip to Pompeii? Use this virtual field trip that includes photos and 360-degree views of this ancient Roman City. Click on slides at the bottom of the page to see different areas of the ruins such as the Temple of Isis and street views of the entire archeological area. In the age of shrinking opportunities for field trips, jump right in! This site is perfect for use on an interactive whiteboard as you explore this well-preserved example of ancient Roman life. Enhance learning by having students use Fakebook, reviewed here, to create a "fake" page similar in style to Facebook about a day in the life of an inhabitant of Pompeii. As an alternative, enhance learning by having students create blogs using a tool like Edublog, reviewed here, to reflect what they have learned about ancient Pompeii and Roman life. Understand battle tactics from the stone age through modern times with hands-on gameplay with Junior General. Use printables from the site to create paper troops, and then choose from different rules and scenarios to recreate a battle. Be sure to take advantage of the many articles offering tips and advice for using and modifying resources found on the site. Choose from the many different options on this site to create battle recreations offering a much better perspective of troop size and battle tactics. Pique student interest in reading the scenarios by having them cut and prepare figures, forests, and more in advance. Using the figures on Junior General takes some advanced planning, so have students start cutting and preparing figures a day or two before beginning the reading. Modify learning by challenging students to create timelines of the major events of a battle (with music, photos, videos, and more) using Timeline JS, reviewed here. Extend students' learning by using Fakebook, reviewed here, to create a "fake" page similar in style to Facebook about a soldier during a battle. Use the scenarios as informational reading to meet Common Core Standards. Looking for videos and resources that peer into Global Issues? Start with this resource! Click the Video Bank to view resources by themes: conflict, power, human rights, social structures, migrations, economic systems, factors of production, or political systems. Also, view the video bank by location in the world. Videos in each theme are up to several minutes in length and are clips of larger videos. Click on the video of choice, to view the video on a larger screen, see the guiding questions, read the background essay and transcript, and find related links. Text can easily be printed using the print function along the bottom. Videos are easily downloaded, with directions for both PC and Mac users. View the country and region map along the left side along with the accompanying lesson plan. Additionally, click on Lesson Plans instead to display the following for each global issue: overview, learning objectives and standards, media components (with links), and materials. Be sure to note the Prep for Teachers along the bottom of each lesson plan. These resources and videos are extremely flexible for classroom use. Use the film clips for current events, and to also highlight events from the past. Use a video segment to get students thinking about past incidents, solutions, and whether today's environment has changed from that of the past. View a variety of clips from one theme and discuss events in the clip or use a writing assignment to provide time to process the events. Discuss in what ways these clips are similar and other societal, economic, and political factors that affected them. Use any of these videos to find any current events that are still dealing with the same issue today. Be sure to brainstorm how different people, in other areas of the world, would view these issues. Research these issues using resources from other areas of the world to see editorials and news clippings that are not American. Note: Use the country code after your search term or use this news search. Were there other people interviewed about any of these issues? Who are they and what did they say? Consider creating videos showcasing a variety of viewpoints. Use one of the video tools reviewed at the TeachersFirst Edge. Besides the viewpoint of each video, what would be a common question that all videos within the theme have in common? How does the bubble of our American culture hamper our understanding of other people both here in the U.S. and abroad? Research the history and culture of the various areas to identify factors responsible for the themes portrayed by this resource. Learn about the rise and fall of the Roman Empire with these 40 impressive maps. Each map features a different aspect of the Roman Empire such as the vast size of the empire, long travel speeds, and the spread of Christianity throughout the empire. Click on any map to view full size. All maps contain a short description of the contents while many also include links to additional information or clarification of terms. Use these maps to introduce your unit on the rise and fall of the Roman Empire. Introduce this site on your interactive whiteboard or projector. Then have students explore this site independently or in small groups. Include this site on your class web page for students and parents to access as a reference. Have students create a multimedia presentation using Slidestory, reviewed here. This site allows you to narrate a picture. Challenge students to find a photo (legally permitted to be reproduced), and then narrate the photo as if it is a news report. edX offers access to many of the best courses offered at top learning institutions - for FREE! Institutions include MIT, Harvard, and Berkley. Classes are available to complete for a Certificate of Achievement or as an audit. Choose from courses with topics in many areas including computers, literature, and humanities. Each course listing offers a short description of the course, details about the university offering the course, estimated time involved, course staff, and available options for taking the course. Start any course at any time. Take the edX Demo course to get a good idea of how courses work and find out about the online learning experience. Share with students on your interactive whiteboard and take the demo course together. This is perfect for use with gifted and advanced students as an option for college level courses and enrichment. Allow gifted students to enroll in courses that interest them or that provide enrichment beyond classroom content. Share with others, in your building, as a resource for professional development. Explore the topics yourself for some new, engaging topics to round out your own expertise. Allow students to enroll in a course that would fit into their career goals as an exploratory opportunity in that field. This impressive infographic shows information about Viking or Nordic Mythology. Find short explanations for Yggdrasil, Asgard, Vallaha, Odin, Thor, Freyr, Frigg, Loki, Midgard, Valkyries, and Hel. Click on the infographic to make it smaller or larger. 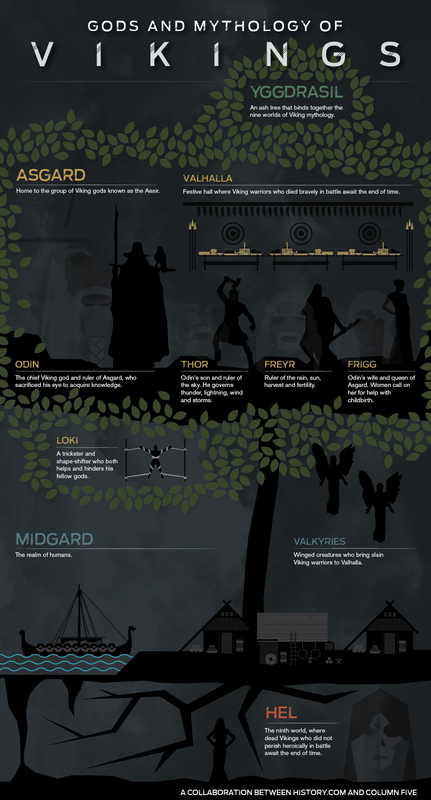 Use this infographic in conjunction with a study of Viking Mythology. Divide the students into small groups to investigate the different terms mentioned on the infographic. Have the students present their findings to the class by creating a multimedia presentation using one of the many TeachersFirst Edge tools, reviewed here. You might consider having students use Nordic Gods, reviewed here, to gather some basic information about the gods, Asgaard, etc. Learn about the ancient Nordic Gods by using this simple, yet thorough, site. Learn about Tyr, Thor, Freya, Odin, and others. Click on a god's name and find out where and what s/he reigned. Learn about Yggdrasill, the World Tree, and Asgard where the gods lived. See the meaning of Germanic, Old English or Old Norse names. Include this site when studying Nordic or Viking mythology. Have a link to this site on your class web page for students to use at home. You might also like to share the infographic Gods and Mythology of Vikings, reviewed here. Divide students into small groups to investigate the gods and where they lived. Have them present their findings to the class by creating a multimedia presentation using one of the many TeachersFirst Edge tools, reviewed here. You might consider having students use Fakebook, reviewed here. Have them create a "fake" page similar in style to Facebook from the perspective of any of the gods. Ask students to create a short story involving one or more of the gods and using the Old Norse names for other characters in their story. You might suggest the definition of the name indicate what that character is about. Use this site as a reference to learn about Egyptian Gods. Find out about Egyptian monsters, some myths tied to nature, and the Egyptian number system, too. At the bottom of the page are links to more resources for Egyptian Gods. Use this site as a starting point to learn about Egyptian Gods for world history and ancient religions classes. It is also an excellent introduction to a unit on Egypt for young learners. Put a link to this site on a classroom computer as an activity center for the Egyptian unit of study. Assign student pairs or small groups a god and to research the myths about that god. Students could create a class book retelling a favorite myth for each god using Creative Common images to illustrate the myth. To find Creative Commons images for student projects (with credit, of course), try Wikimedia Commons, reviewed here. Images and myths can be completed in Classroom Authors, reviewed here, for actual book production. Be sure to include this site on your class web page for students to access both in and outside of class. Travel back in time to enter the Roman civilization. Through videos, interactive timelines, and interactive games learn about the Romans. Categories include inventions, food, numerals, gods, entertainment, republic, slavery, empire, architecture, art, army, education, emperors, and clothing. Enter the world of ancient Romans and become a citizen. Use as a resource when reading Roman Myths or other Roman literature. Compare and contrast other ancient civilizations such as ancient Greece. Use this website as an example for creating other research projects on time eras or places. Introduce on your interactive whiteboard or projector to your class and continue study at centers. Use as background information to create stories placed in ancient Rome. Challenge your gifted students to create their own world and all the inventions, foods, numerals, gods, entertainment, art, education, and leadership. Ducksters is a safe, extensive, educational portal for kids. Find a wide choice of content such as interactives, sports, movies, and music. Begin by choosing a category to explore choices. The study category includes extensive information such as world history, many biographies, science explanations, and information on all continents and many countries. Interactive subjects include math times tables, checkers, and guess the country. There is a TON here to explore. This site is a perfect addition for use with a biography unit. Explore and share information categorized by topics such as Civil Rights, the Cold War, Ancient Greece, and WWII. Extend student learning by having students use Fakebook, reviewed here, to create a "fake" page similar in style to Facebook about a president, famous scientist, or nearly any other real or fictitious person. Be sure to create a link to the site on your class webpage or newsletter for students to explore at home. Create a link on classroom computers for students to use the interactives during center time. Retronaut is an archive of historical photos, though not your typical photos. These images are sometimes quirky, and generally unexpected. Many have explanations about the period. View images of 1970's rock stars with their parents (Elton John, Frank Zappa, Eric Clapton to name a few). See Selma's Children, What Parisian Fancy Ladies wore in 1906, history's first women aviators, and much more. Explore the site by Most Popular, Featured, or The Latest. Click on an image to view a "capsule" with other related images. Some of the images have links under them for attribution, and you can see and read even more about that topic. Under latest, this reviewer found topics that were just added five days before, so you may want to check back if you do not find what you're looking for. Warning: At the time of this review there were two topics that may be inappropriate for the classroom. Use the URL of the topic you wish to share in a new window or tab of your web browser. Share Retronaut via Mashable with students to explore images from a given time or relating to any historic topic to get an interesting perspective not typically seen in textbooks. Create capsules using images to share for any classroom project or allow students to create their own in conjunction with classroom presentations. Use Wellcome Images, reviewed here, with over 100,000 historical images if you do not find what you want on Retronaut. Galleries are not moderated, so check before sharing on your interactive whiteboard or projector. You can always use the URL of the topic you wish to share on a new tab of your web browser. Discover what influences myths from ancient cultures have on contemporary cultures. Add pizazz to your unit on mythology. Learn about famous writers. Explore the detailed lessons and plans. Visit Myths From Around the World, a writing activity that teaches about myths from fifteen regions of the world. Read the myths of ancient Greece. Find directions to write your own myth with Jane Yolen's help. Lessons instruct the learning of the characteristics of a myth through reading, comparisons, and making inferences. Peruse the unit on Heroes and Legends, which includes lesson plans for examining heroes and their common characteristics. Furthermore, there is an Inuit unit that dives into the myths, legends, and stories from the Inuit culture. Learn about the Hero Twins from the Mayan culture. There is much here to explore for all ages! After you choose your level, discover one or many of the lessons to integrate into your English Language Arts or Social Studies curriculum. Choose your objectives, and find the lessons that are appropriate. Some lessons can be shared on the interactive whiteboard or projector. Others are more appropriate alone as individual work. Materials are included so much of the prep work is already done for you. To conclude the myths unit, have students create a play featuring a unique culture and a hero they create. Students will need a detailed script containing; theme, plot, settings, and characters including a hero. Go as far as you want developing props, costumes, and accompanying sounds and music. Have students present using a live presentation, video, or digital storytelling. Choose from the TeachersFirst Digital Storytelling tools, reviewed here. This site is a great reference for an after-school enrichment program on writing, reading, book clubs, or even self esteem. Find simple descriptions of the main Roman gods, goddesses, and monsters. Learn the origins of the names of the months and weekdays. Find activities for designing a Roman mosaic and two board games the Romans played. Use this site as a reference for students studying world history and ancient religions. It is also an excellent introduction to a unit on the Romans for young learners. Put a link to this site on a classroom computer as an activity center for the Roman unit of study. Assign student pairs, or small groups, a topic (god or myths about that god). Have students create a multimedia presentation using UtellStory, reviewed here. This tool allows narrating and adding text to a picture. Challenge students to find a Creative Commons photo or image, and then narrate the photo as if it is a news report about the god's life. To find Creative Commons images for student projects (with credit, of course), try PhotoPin, reviewed here.